“Trash like that shouldn’t be in this rank,” one said. “If he gets enough reports he’s actually gonna get banned. Let’s do it,” said another. Stevooo is considered a “one-trick,” a term for Overwatch players who are very, very good at one hero and don’t like playing others. Stevooo’s “one trick” is Symmetra, and with his high-level Symmetra play, Stevooo has amassed an audience for his Twitch channel, which is entirely Symmetra-themed. While he’s streaming, Stevooo spits out Symmetra facts and playstyle advice for his audience, which he says is made up of other avid Symmetra fans. His Twitch chat is populated by trollish Symmetra faces. Gameplay clipped by his fans contains Symmetra highlights alongside quips about Overwatch culture. As of the last few months, though, Stevooo’s single-minded devotion to Symmetra in the game’s competitive mode has earned him tireless hate and scorn. A highly situational light-bender, Symmetra’s turrets make for some nasty munition when protecting territory. In other scenarios—for example, when she’s moving onto a control point—Symmetra is a controversial pick. Her turrets aren’t easy to weaponize when she’s entering enemy zones. Her teleporter and shield generator are at a greater risk if placed on enemy turf. That’s why, in a lot of contexts, Symmetra is seen as a “troll pick.” Regardless, Stevooo almost always picks her. Although he’s rated among the top ten Symmetra players in the game, and has an impressive 57% win rate with Symmetra, Stevooo’s teammates are consistently unsure that his Symmetra is a winning choice—or, more broadly, angry that he’s not playing the game the way they think it’s meant to be played. In spite of teammates’ feedback, Stevooo keeps insta-picking Symmetra most matches. 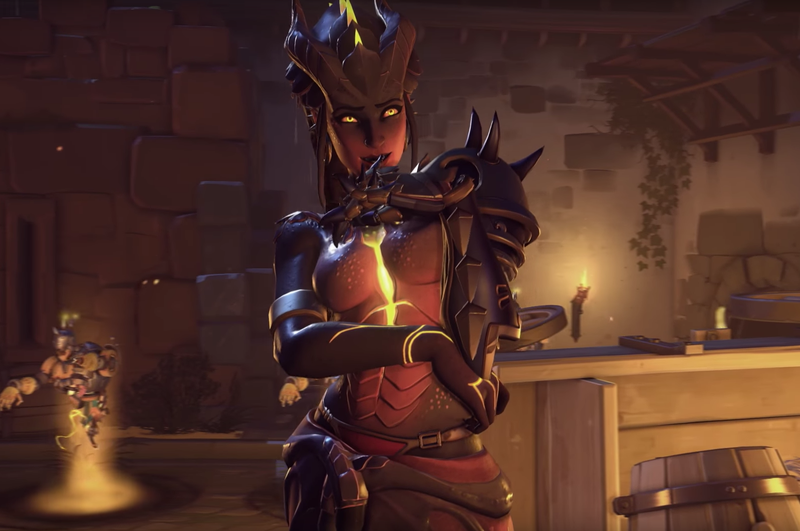 Blizzard has come out to say that one-tricks are fine; but with changes to Overwatch’s reporting system that have anecdotally helped curb harassment, the game is taking swifter action against players deemed disruptive or toxic. After that night last week, Stevooo’s account was suspended for “disruptive gameplay,” the sixth time he’d faced a ban. Of course, this isn’t just happening to Stevooo, whose multiple accounts and shady competitive challenges may also have landed him in Overwatch jail. Earlier this year, Kotaku reported on a sniper player whom teammates endlessly harassed and reported. Last month, a top-ranked player who one-tricks Torbjorn, another highly situational defense hero, was suspended multiple times after several player reports (Correction—12/15/17: Overwatch game director Jeff Kaplan wrote a post on the Battle.net forum stating that the Torbjorn main was banned after 220 reports for harassment). Two days ago, a big discussion on Reddit from a one-trick Symmetra player who’d been repeatedly banned garnered over 1,600 comments. Stevooo’s situation has inspired mixed reactions from the Overwatch community. When he’s posted threads about his suspensions on Overwatch forums, his character and playstyle are hotly debated. Lots of fans agree that it’s unfair for him to be instantly reported by teammates. Others point out his propensity for trolling and smurfing, adding that one-tricking is selfish. A few suggest that he just wants to draw attention to a system he considers unfair—or to his Twitch channel. Fans of other first-person shooters or MOBA games might be a little surprised that putting all your time in one hero is a highly problematic way to play Overwatch. A team-based shooter, Overwatch offers 26 playable heroes across the offense, defense, tank and support categories. Optimal teams are diverse. And, the wisdom goes, optimal players are flexible. In Overwatch’s competitive mode, team composition is an ever-flowing discussion throughout a match. If it’s determined that a player isn’t pulling their weight or actively countering a known problem, that player will almost certainly be asked to switch heroes. It’s an expectation that high-level players will know how to play several heroes, although everyone has their favorite. Stevooo is a Symmetra main, and as a result, players have reported him, threatened him and asked him to kill himself. “People report me because they have a very specific idea of what the game should be,” Stevooo said. He takes issue with the idea that an Overwatch game is won primarily through teammates’ flexibility. Building a well-rounded team, he says, is only a factor in what can win a game. The culture should be more open to the idea that, sometimes, a player is just really good at one hero. And that player can pave the team’s way to victory. “Why on earth should players who aren’t doing anything against the rules be punished by other players? Blizzard is the one who designed the system, and made the rules, yet players are being punished for doing something they stated wasn’t at all an offense,” Stevooo said. The counter-point here—and it’s a strong one—is that when one player locks down a hero every game, other players must build a team composition around that player. Because balanced teams are generally considered better, Stevooo’s teammates often feel forced to compensate for his one-tricking. And in a team-based game like Overwatch, it’s looked at as poor teamwork. Players who don’t want to end up with one-trick teammates don’t have too much recourse aside from reporting them. In the past, Overwatch offered an “Avoid Player” function. Predictably, it was abused. It would take players like Stevooo eons to match up with others for games. When the function was live, one-tricking players pointed out that they too paid $60 for the online game. Didn’t they have a right to play it?